Eager, doubtless, to preserve and burnish the penumbra of ‘deal-maker’ following his foray to Singapore, and even more eager to deflect attention from an increasingly ominous Mueller inquiry, President Donald Trump dispatched his national security adviser to lay the groundwork for the first summit meeting between a Russian and a US leader since Barack Obama went to Moscow in July 2009. Not only was the timing noteworthy—the place was too. John Bolton went not to neutral territory, but to the mediaeval fortress from which Russia has traditionally been ruled, the Kremlin. That itself was a major concession. In return, perhaps, the emissary didn’t just meet Foreign Minister Sergey Lavrov—he was accorded an audience with Vladimir Putin himself. This allowed Putin to set the terms of debate by a small rewriting of history: Russo-US tensions, he said, have little to do with Russia’s redrawing of borders since its invasion of Georgia in 2008, but everything to do with domestic opposition to Trump. Nor did Putin forgo the chance to define the goal of the summit as the restoration of ‘full-fledged’ US–Russia bilateral relations. 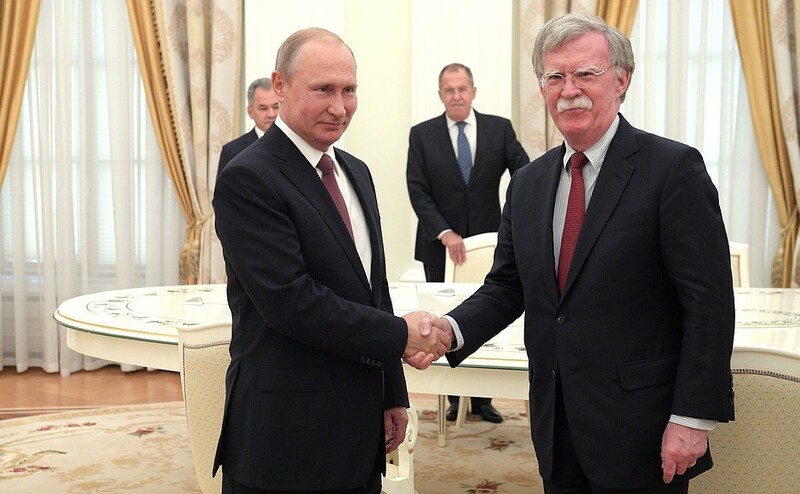 As was wholly predictable, Bolton, the reputed hawk, has confirmed that the convergence of US and Russian interests is sufficient to warrant such a meeting of the presidents. Attention now focuses on the form and content of the forthcoming encounter. Meetings generate expectations, and summits generate inflated expectations. The largely servile Russian media have been circumspect, referring only to Syria as a possible agenda item. That’s a tactical false trail: in the summit communiqué much may be made of Syria, but it’s now secondary for Putin. Trump has already in effect given him a free hand there, deserting the US’s former allies, including the Kurds, to deal with a phalanx of Putin, Assad and Erdoğan assailants as best they can. A US acknowledgment that Crimea now belongs to Russia irrevocably is presumably high on Putin’s list of desiderata. Such an acknowledgment would also imply recognising Russian control over South Ossetia and Abkhazia, the parts of Georgia it seized in 2008. All that’s required for that outcome would be Trump’s decision, in the interests of ‘The Deal’, not to raise it. Second, Putin would like to see a lifting of sanctions. With that in mind, and to highlight the tensions between the US and the EU, he may decide to present himself as a champion of free trade. But he knows that sanctions are a difficult, if not a no-go area for Trump, at least until Mueller and his inquiry have been dealt with. So, Putin may well decide to be patient. Commentators, including Aleksandr Lukin, a loyal advocate for Putin’s policies, and Aleksei Venediktov, the outspoken editor of the liberal radio station Ekho Moskvy, have said that in the long term Putin wants to secure a new, updated edition of the Yalta Agreement of 1945 between Roosevelt, Stalin and Churchill, which carved Europe up into spheres of influence. Ultimately, too, Putin wants to see NATO abolished (as he has said)—that is, the US departure from the western part of Eurasia. He must be relishing the disarray in NATO, now, with members such as Turkey, Greece, Italy and Hungary dubious allies at best. Putin will have welcomed too the promising electoral trends in the EU, with the emergence of right-wing pro-Moscow governments in Austria and Italy; and can not unreasonably hope that the EU will collapse under the weight of its contradictions, and the tsunami of refugees and economic migrants that his actions in Syria have helped to swell. Let us recall: Obama’s attempt to ‘reset’ US–Russian relations in 2009 failed mainly because the Russian position was that all the blame for deteriorating relations lay with ‘the West’—Russian shorthand for ‘the US and its close allies’ (a formulation that Trump is making archaic). That is, no concessions could reasonably be demanded of Russia. But now Putin’s overriding and priority interest is a reset of his own, a long-term strategy that requires that Trump be returned to office in 2020: Trump is an asset who must be protected and strengthened. That is the goal against which all of Putin’s policy options for the summit will be weighed. For Trump the meeting is mainly about domestic politics: he and his team want to forestall and deflect any damaging findings by the Mueller investigation. They need summit outcomes that support that goal. Putin and his summit-planning cell know this, so their aim will be to reinforce Trump and a changing international balance of power that’s shifting to their advantage. For the Kremlin, avoiding any act that might potentially destabilise this favourable trend will be crucial. So, what is a Putin–Trump meeting likely to focus on? The overall theme will probably be that ‘getting on with Russia’ is in the interests of all. So how can US–Russia relations gradually be improved? Obviously, by concentrating on ‘issues of common concern’, and those will likely prominently include ‘cooperation’ in counterterrorism and arms control. Arms control outcomes especially would play well to most audiences, global and domestic. In particular, Putin would probably appreciate negotiations towards an extension of the INF Treaty and updating, amending and extending the New START nuclear arms treaty. The process lends substance to Putin’s claims to superpower status, and any outcomes with his current opposite number may well be favourable to Moscow. We can also predict with some confidence an exhumation of that staple of Cold War Mark 1 summits, an announcement that Putin and Trump are re-activating the Kremlin–White House hotline. But while some things remain the same, some change: the Tsar of All the (post-Soviet) Russias now spends much of his time at his palace in Sochi, while Trump’s preference is his resort at Mar-a-Lago in Florida. The big and skilful investment that Russia made in seeking to influence the US presidential election, an outcome which prompted a fusillade of popping champagne corks in the Kremlin, and Putin’s reported response that ‘it doesn’t get better than this’, could soon reap even more handsome dividends. An optically fruitful summit may make it easier for Trump to finally rid himself of the troublesome Mueller, and appoint a better kind of Republican in his place. Kyle Wilson is a visiting fellow at the Centre for European Studies at the Australian National University and a former diplomat who had postings in Poland, Russia and China. Image courtesy President of Russia.